More 3 Stars chefs here. Other Japanese chefs here. First of all, Chef Yoshiharu is a third-generation Sushi Chef from Kyoto. 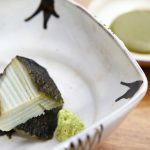 He trained with Master Chef Yoshitake in Ginza for several years before moving to the U.S.A. to gain insight into western palates and to perfect his English language skills. Moreover, he spent 10-years in the U.S. working behind esteemed sushi counters in both New York City and Atlanta. He arrived in Hong Kong to launch Sushi Shikon in 2012. 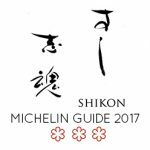 The restaurant earned it’s first Two Star Michelin status during their first operational year, and has since gone to achieve the pinnacle rating of Three Michelin Stars in the two years since. 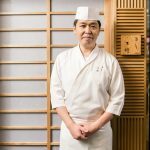 Chef Kakinuma’s greatest pleasure is educating the guests who sit across from him at his counter. Both his father and grandfather were sushi chefs. When he decided that he too wanted to be a sushi chef, his father told him he must learn from someone else so that his success would be his own. He was introduced to Chef Yoshitake by a family friend and began as an apprentice at Sushi Yoshitake. He worked under him for many years and Mr. Yoshitake spotted something in him, because although it is very unusual for a Sushi Master to directly train an apprentice, Mr. Yoshitake did this for Kakinuma. Chef Kakinuma wanted to expand his culinary experience and better learn English, so he moved to the U.S.
During his time there he worked in restaurants in both NYC and Atlanta, perfecting his craft and also learning more about western pallets. After ten years in the U.S., Mr. Yoshitake contacted him about opening the first Yoshitake outpost in Hong Kong and asked him to move to Hong Kong to head the endeavor. Chef Kakinuma enthusiastically agreed. Sushi Shikon opened in Hong Kong in 2012 originally under the name Sushi Yoshitake. The name was later changed to relieve confusion about Sushi Yoshitake in Tokyo moving. Their first year opened, Chef Kakinuma navigated them to their first 2 Michelin Stars. The following year they achieved their 3rd Michelin Star. They also ranked in the Hong Kong Top 100 Tables guide. 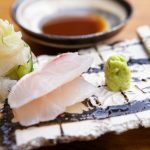 Every day, Sushi Shikon has the freshest ingredients flown from Tokyo. 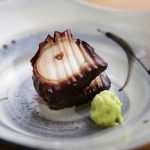 The restaurant,whichclosely recreatesthe standards of its Tokyo-based sister restaurant,offers an intimate atmosphere, where up to eight guests can watch sushi masters craft each dish in front of their eyes. 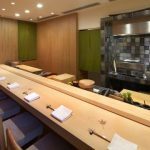 Complemented by a wonderful sake and wine list, Sushi Shikon offersa quintessential Ginza sushi experience.